This is part 6 of a series of posts in which I am searching for a large acceleration in sea level rise rate in the latter part of the 20th century that could reconcile the 1.8 mm per year average rise rate for the century attributed to tide gauge data and the approximately 3 mm per year rise rate for the tail end of the century attributed to the satellite data. Australia has only 5 tide gauge stations with data sets that are at least 90% complete going back to 1960, but four of those go back to 1940 or earlier. 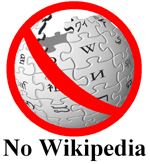 I will analyse this data in my usual way (detrend, weight, average, and derivative). Regional sea level rise rates are usually swamped by things other than just global effects. 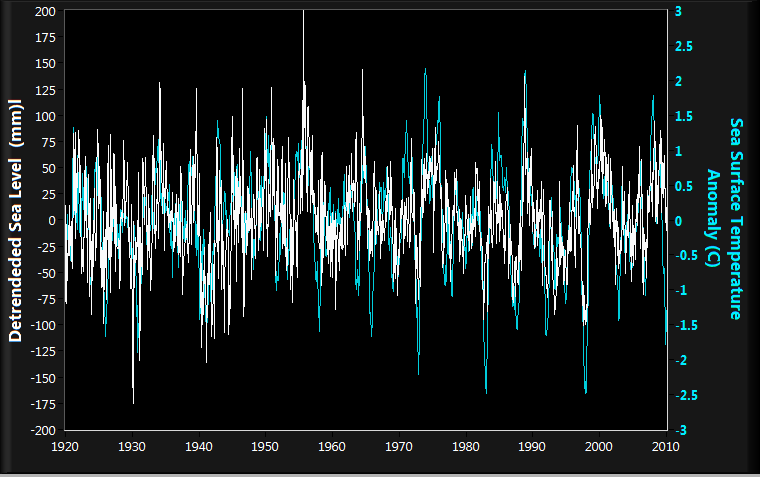 In the case of Australia we may be able to disentangle one of these effects – the El Nino Southern Oscillation. I will also consider the component of the Australian sea level data that is orthogonal to the ENSO3.4 sea surface temperature. The slide show shows my standard analyse. The El Nino Southern Oscillation dominates the sea level around Australia. The following plot shows an overlay of the detrended weighted average of the five Australian tide gauge sites and the NINO3.4 index from the Hadley Centre. I am including tide gauge data after 1915 which include at least two tide gauge sites at all times and no large data gaps. The similarities are obvious. 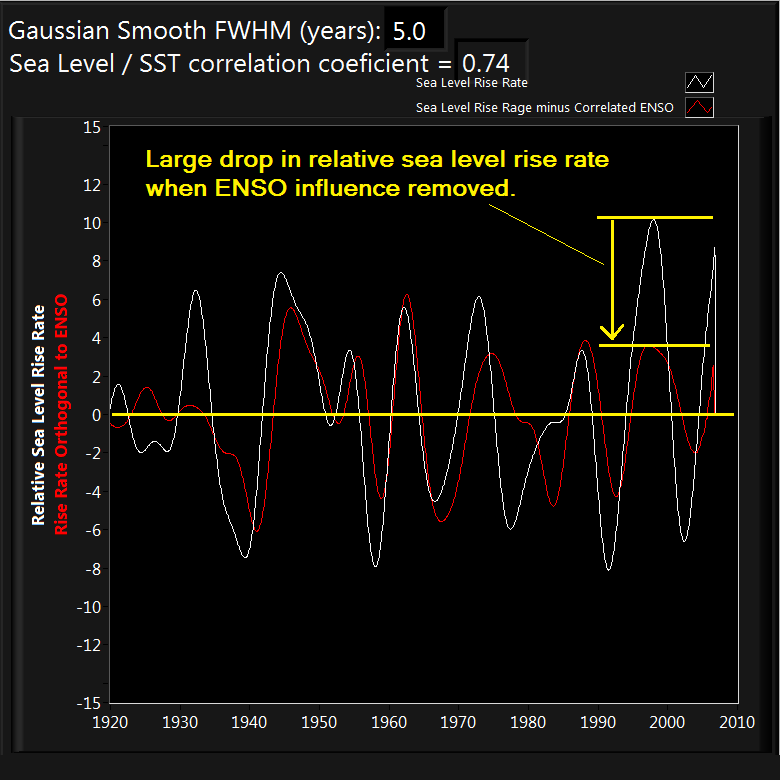 Let’s try to remove the ENSO effect from the sea level around Australia. 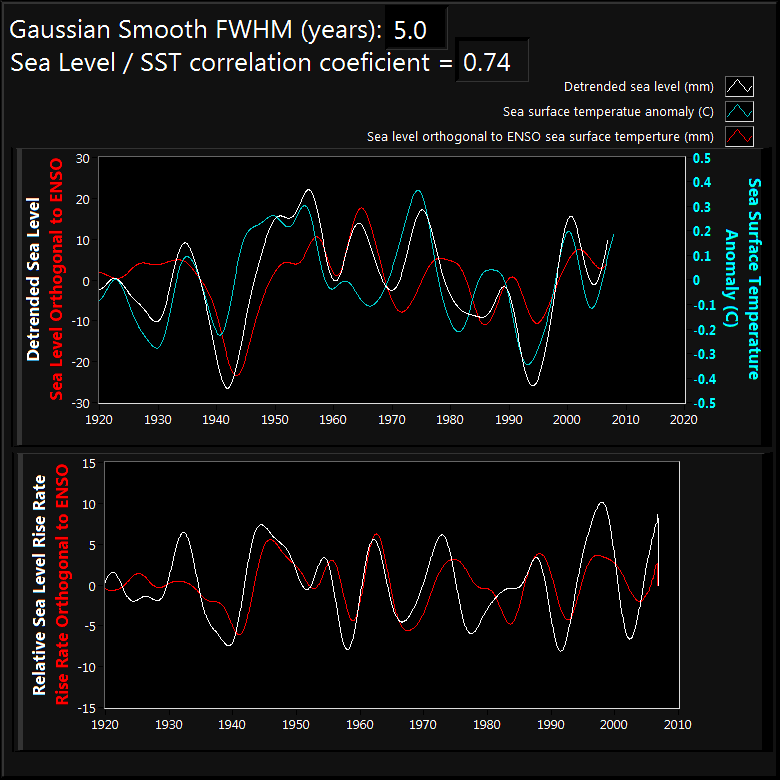 I will do that by breaking the sea level data down into an ENSO correlated and ENSO orthogonal parts. If the ENSO orthogonal part of the sea level is truly independent of ENSO, then it shows what the sea level around Australia would look like without an ENSO effect. 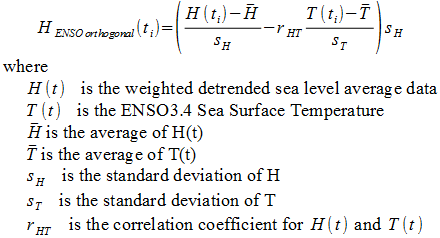 Here is the formula for finding the ENSO orthogonal component of the of the sea level data. 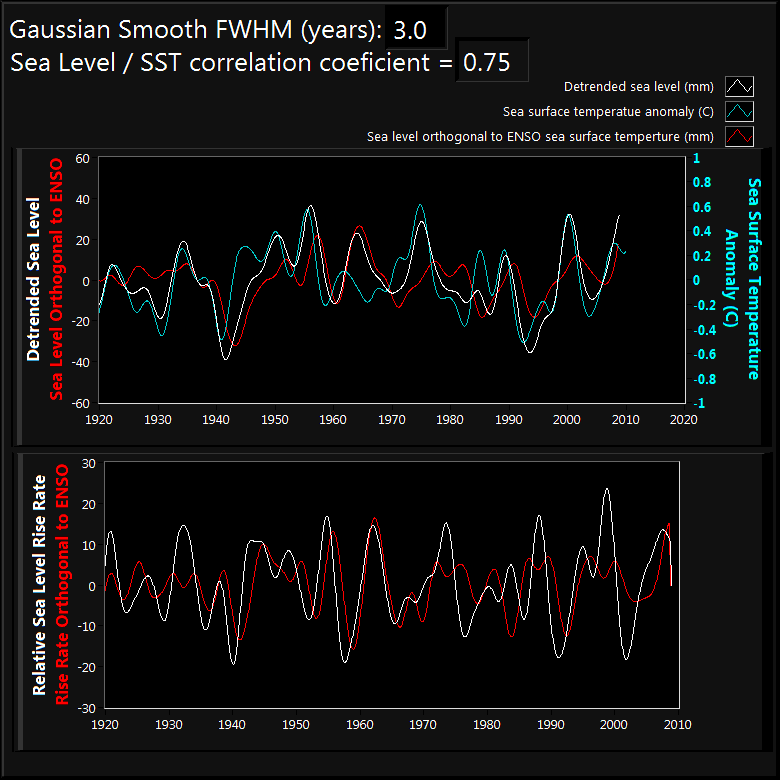 The top of each of the following slides shows the weighted, detrended, averaged Australian sea level (white), ENSO3.4 sea surface temperature (blue), and the component of sea level data that is orthogonal to the ENSO3.4 data (red). 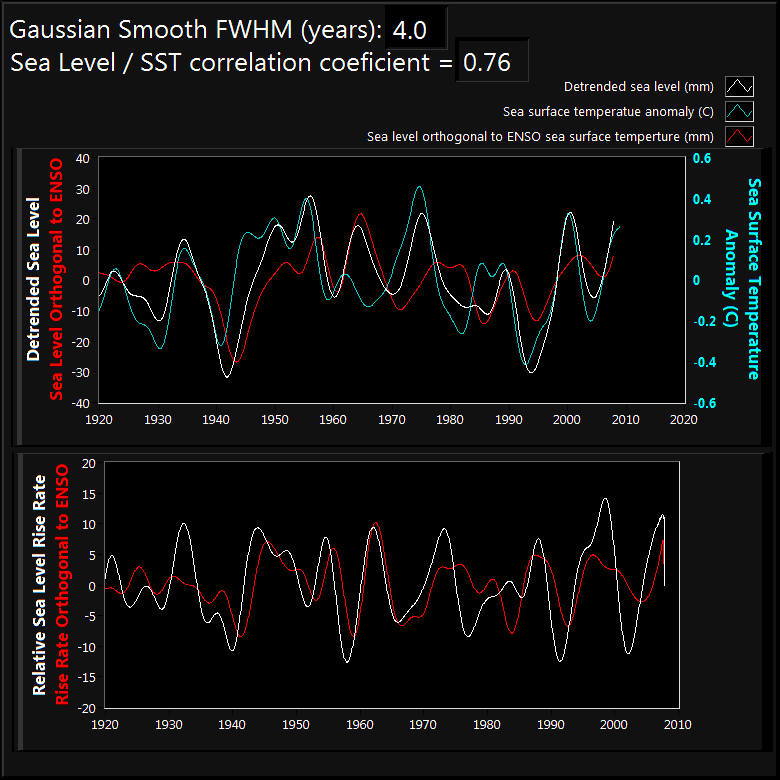 The bottom of each slide shows the corresponding relative rise rates associated with sea level (white) and with the ENSO orthogonal component of the sea level (red). Each successive slide shows the same original data with increasing Gaussian smoothing. The most important thing to notice is that when the ENSO influence is removed the sea level rise rate at the end of the century is significantly reduced. 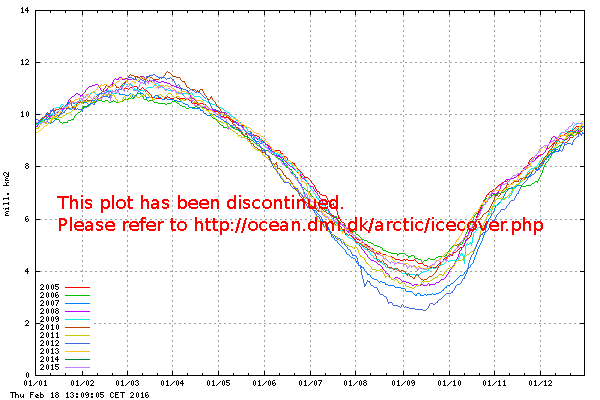 Large drop at end of century with ENSO removed. 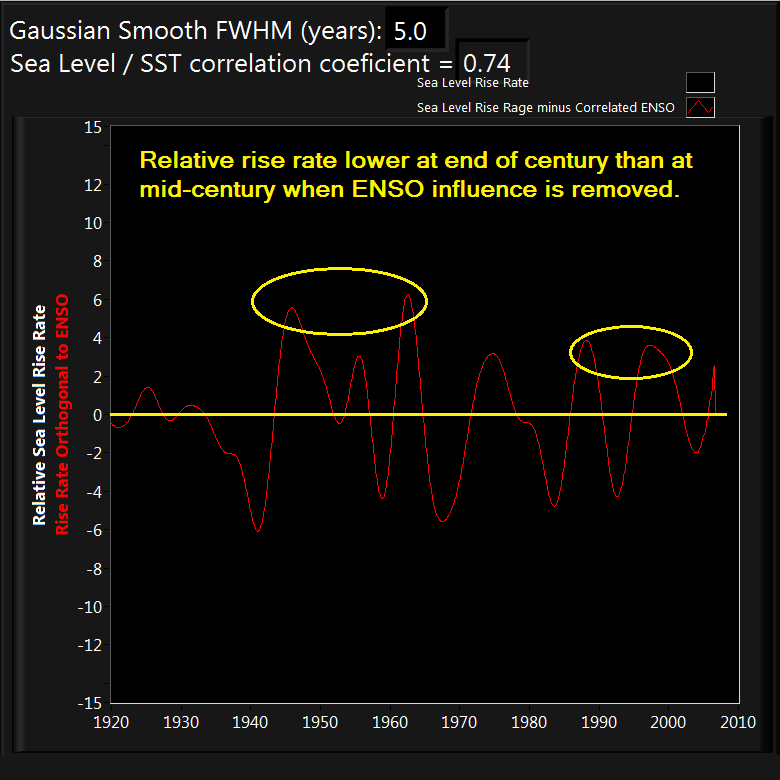 Rise rate lower at end of century with ENSO influence removed. If the higher relative rise rates at the end of the century are due to ENSO, then it is interesting to ask whether ENSO fluctuations are greater now (because of global warming?) than in the past. The best answer to this question can be found in Highly Variable El Niño-Southern Oscillation Throughout the Holocene (Cobb, et. al., Science, 339, 1/4/13). Twentieth-century ENSO variance is significantly higher than average fossil coral ENSO variance but is not unprecedented. Our results suggest that forced changes in ENSO, whether natural or anthropogenic, may be difficult to detect against a background of large internal variability. 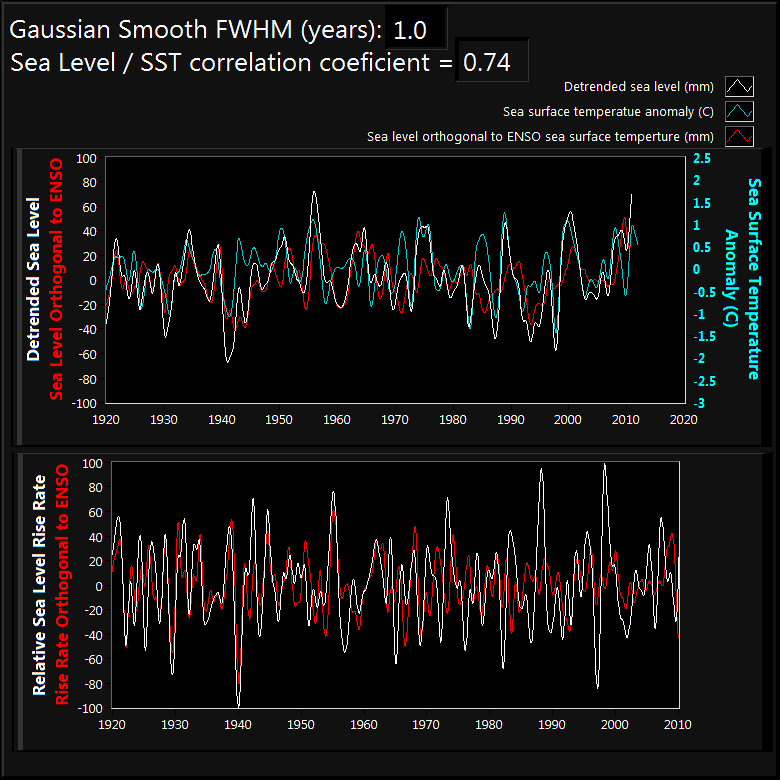 [T]he detection (and attribution) of any changes in ENSO properties would require very long time series spanning many centuries, to the extent that detection of such changes is even possible. [M]uch of the observed differences in ENSO variance over the past 7 ky reflect strong internal variability… Relatively robust 20th-century ENSO variability may reflect a sensitivity to anthropogenic greenhouse forcing, but definitive proof of such an effect requires much longer data sets than are currently available, given the large range of natural ENSO variability implied by the available fossil coral data. According to my usual analysis the rise rate at the end of the century was clearly higher than the average (from 1940 to present), but no higher than the 1940s. 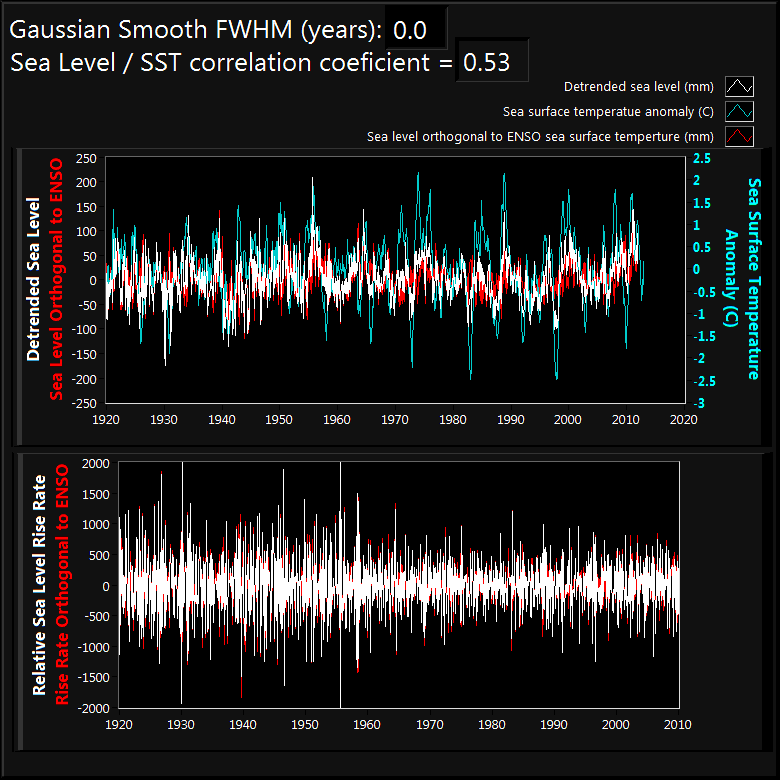 Does the reconcile the satellite data and tide gauge data? Yes.